Headlines: Well the opening has been and gone and it was a great one by all accounts. There is a some really good water in the rivers and some great numbers of quality fish. Lake Eucumbene is just below the level it reached last season and is really set to fire in a very big way for bank anglers. In fact, for some it already has. 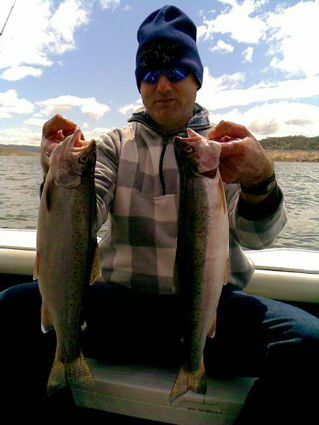 Jindabyne has also continued to rise and is fishing well. These next few months will produce some outstanding trout fishing and by the quality of the fishing now will improve as it warms. There has been some ramp work done at Angler's Reach recently. One is at Angler's Reach Caravan park. Though not usable at present, as the lake rises it will provide useful access. The other is located past the caravan park, on the right, near the end of the main road. This ramp is usable now and reports suggest it is very good. 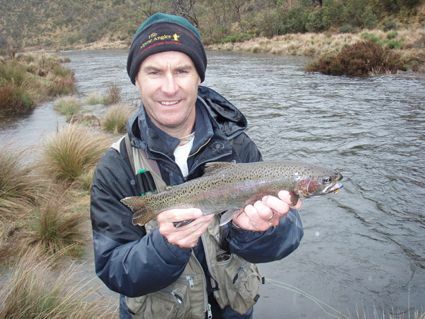 The Thredbo and Eucumbene rivers have turned on some great fishing over the weekend for fly anglers. Plenty of fish in both rivers have been seen, lost caught and released. Most have been rainbows but there were a few nice browns caught as well. Asusual for this time of year Glo bugs and Beadhead or weighted Nymphs have been the main fish takers. There were a few fish seen rising and some anglers caught them on dries also. This fishing will be good for a few weeks to come yet and as the weather warms the dry fly fishing will be outstanding too. It is important to get your flies down and fished dead drift at the moment. Early starts are important to maximize your success also. There is a very good possibility of some dry fly fishing during the warmer part of the day with the current temperatures we have had in the past week. Smaller rather than larger patterns will generally give best results early in the season. Midges Caddis and a few Mayflies should start popping out inthe next week or so. Small stimulators, Adams, Humpy's are good patterns to try. *Sarah Romeos caught three fish to 60cm in the Eucumbene on the weekend on caddis imitations. Pretty good for a four and a half year old!!!! *Peter Jeffery from Canberra had a great session on the Tumut river over the weekend catching fourteen rainbows on dries to 48cm. Good fun fishing indeed. 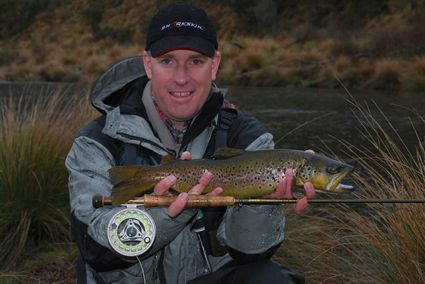 *David and Chris from Cooma fished the Providence Flats for five fish to 1.3 kg on Globugs and nymphs. 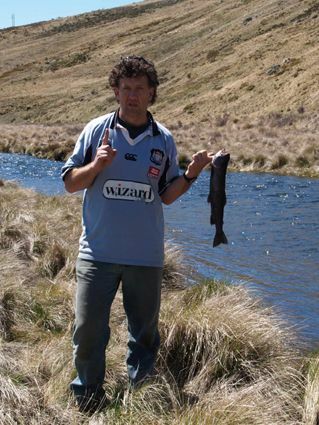 *Gonzo from Canberra caught two nice browns at the providence flats to 1kg. Globugs were the best flies. *Even managed to fish the opening day myself this year with good mates Craig, Matt and Sturge. We fished the Eucumbene and managed near one hundred fish caught and released between us. Fish were mostly rainbows around the 40cm mark, although I managed a brown. Globugs were the best flies though some ate Matt's NZ bombs. Few pics below. Lake Eucumbene:- Is set to fire again this Spring. As mentioned the lake level is almost at last seasons high. Those that fished the lake last season will remember the huge amounts of aquatic insects, caddis, corixa, snails, damsel nymphs, midges, mudeyes etc that were in abundance, as the lake rose into the grass, and the subsequent rainbows that came in close to feed of an evening and morning. Well it is all set to happen again and as the edges warm the midges will come on and the fish with them. The lake should rise to somewhere between 25% and 30% with any luck. Think locations like Rushy Plains, Seven Gates, Buckenderra, Brookwood, Braemar, Cobrabald, Waiunui, Coppermine, Collingwood, Yens, Wangrabelle, Springwood all these areas are and will continue firing for a good couple of months now both with polaroiding and evening rises. Watch this space for further developments! Muddler Minnows, Sunset flies and Fuzzy Wuzzys and Lumos work very well at this time of year. Lake Tantangara :- %.Although the dam dropped a little this week it is still more than worth a look at present. The edges will be the place to fish with small wets and nymphs. Three Mile Dam has also turned up a few fish on the weekend and is another option if you are up fishing the Eucumbene river around Kiandra. The lake has been a little discoloured in some areas due to wave action from the wind but this is not detering the fish. All types of lures will work this weekend with yellows, greens and pinks in Tassie and Cobra style lures very popular. I spent 5 days at the cabin in Buckenderra last week. Two of the gang arrived on Sunday evening so we fished out of John's boat on Monday and trolled for 9 hours for two fish. As you can see they are nice rainbows of 45cm and full of Mudeys. Eddie in the picture. Taken with the phone camera as I left the other one at home. Fished out of my boat on the Tuesday and worked hard all day for one hit. There was so much food in the water the fish would not co-operate. But as they say, a bad days fishing is better than a good day at work. Catch up with you soon. 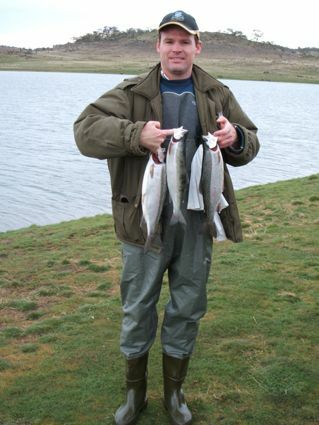 These fish were caught at Brookwood Bay area on the Shad Rap and Canberra Killer. Went to Eucumbene on Saturday stayed overnight.....not a bite, which has been my usual result at the lake. thought I would give the river a go. A friendly fly fisherman walking by said try something green & gold, so I tied on a little celta and away I went, couple of cast's later I caught my first, not only for the day, but my first ever, so it was a pretty special day. Caught one other under size which was returned to fight another day. On the way home stopped at Bolaro on the Murrumbidgee first cast from the bridge and smack the lure was taken straight away, the fish flew out of the water and off my lure, but another great moment for me. Hooked one more....which also managed to get free. All in all a great day, the weather was glorious, I missed my beloved Manly winning the grand final.....but hey I caught my first trout. *Paul Kowalski and Andrew Cheney did well in the Eucumbene River spinning with Atomic soft plastics and also drifting Glo bugs. They caught twelve for the day with the biggest a rainbow just under 2kg. 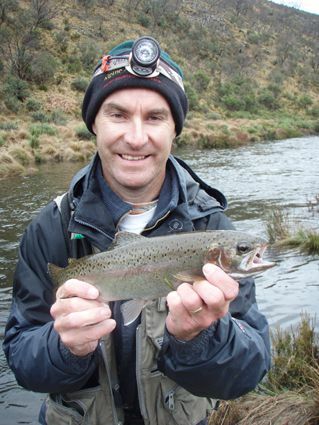 *Lockey Clark caught a fantastic 2.5kg rainbow fishing the Thredbo. A celta in purple was the lure used. *Athol and Sam from Canberra fished around the Sid's Bay area for 13 fish to 2.4kg. They caught all four species of Salmanoids in Jindabyne. RMG Scorpions were the killer lures. 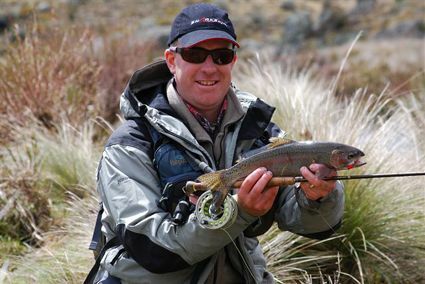 Baitfishing :- Bait fishing has been excellent in Jindabyne with Gulp Power bait and standard Powerbait. Quality fish are coming in from the Rushes Bay, Waste point Kalkite and Hatchey Bay areas. *Dear Alpine Angler, Every week I read your latest fishing reports, even if I'm not planning a trip. Last weeks advise of worms and power bait was spot on. I caught 9 fish over the weekend using worms and lime/ rainbow power bait. Thank you for the advice. I regularly call in to the shop and get your advise and pick up some bait. Thank you again for all your help. I have attached some photos of my catch. All of the fish were around 1kg and in excellent condition. I will hopefully be back up there in a few weeks. *Twelve year old David Bleakley from Sydney fished East Jindabyne and landed two rainbows and one brown on spinners and scrub worms. A good effort.